Although many of the top teams aren't playing this weekend, it doesn't mean that things are all quiet on the World Curling Tour. In Morris, Man., 64 teams are battling it out at the Dekalb Superspiel. 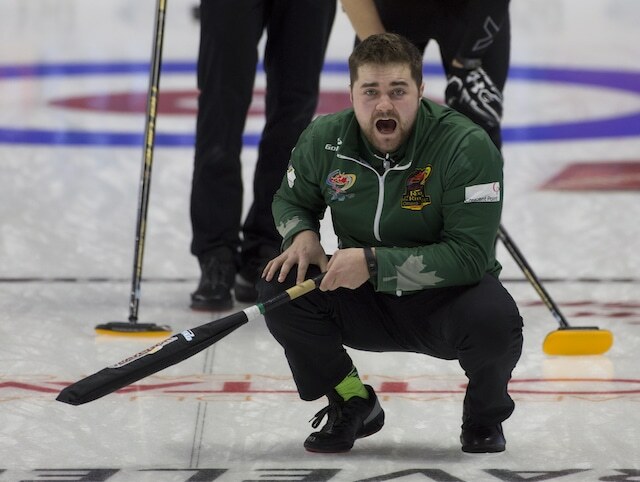 Matt Dunstone, now playing out of Regina, headlines a 32-team men's bonspiel that also includes Saskatoon's Kirk Muyres, Winnipeg's Jason Gunnlaugson, and Charley Thomas - who is now playing out of Ontario. They'll all be playing for a share of $45,000 and valuable CTRS points. The women's side is equally impressive boasting Canadian and world champions. Two-time world champion Binia Feltscher (Switzerland) will fight through the women's 32-team field that also includes Allison Flaxey (Winnipeg), 2011 Scotties Tournament of Hearts champion Amber Holland, and Korea's Un-Chi Gim. In Kemptville, Ont., 24 women's teams are playing at the Royal LePage Women's Fall Classic. Five-time Canadian champion Mary-Anne Arsenault is certainly the most decorated curler in the event, but Scotties skips like Sylvie Robichaud (Moncton, N.B.) and Kerry Galusha (Yellowknife). In Halifax, the Dave Jones Alexander Keith Mayflower Cashspiel features 18 teams including 2004 Brier winner Mark Dacey (Halifax) and last week's Grand Slam qualifier Jamie Murphy (Halifax). Meanwhile, on the West Coast, the Raymond James Kelowna Double Cash is on the ice at the Kelowna Curling Club, with sixteen men's teams playing for an $18,000 purse. Among the competitors are Vernon's Jim Cotter (with new-look team featuring Steve Laycock, Tyrel Griffith and Rick Sawatsky) and Canadian Junior champion Tyler Tardi (Langley, B.C.) with his new team of Sterling Middleton, Matt Hall (formerly of Ontario) and Alex Horvath. Mixed Doubles is also on the schedule this weekend, with the MadTown DoubleDown presented by Leinenkugel's in Madison, Wisconsin, featuring Canadian teams including Winnipeg's Shannon Birchard and Catlin Schneider, Chelsea Carey and John Morris, and Calgary's Kalynn Park and Kraig Dereen. In a weekend sandwiched between two Grand Slam of Curling events, many of the top teams have opted to take the weekend off and recharge before the Tour Challenge in Thunder Bay, Ont. For all scores and updates, keep your eye on CurlingZone.com.